The view was taken from Ibn Tulun Minaret, specifically from the spiral stairway to the Minaret. 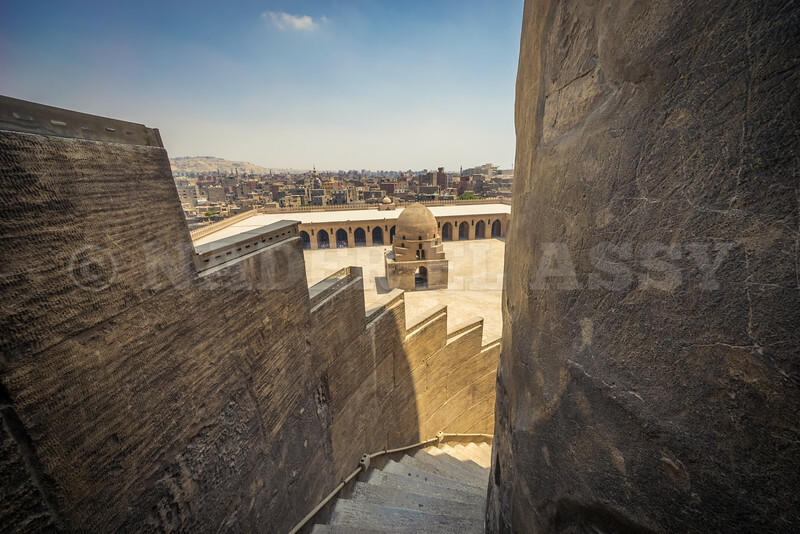 It’s a relatively narrow helical outer staircase similar to that of the famous minaret in Sameraa that takes you from above the Mosque up to the Minaret. This design is the only one in Cairo. It is arguably the oldest mosque in the city surviving in its original form, and is the largest mosque in Cairo in terms of land area. تم التقاط الصورة من على السلم الحلزونى لمئذنة مسجد احمد بن طولون. السلم ضيق ويلتف حلزونيا حول المئذنة من الخارج مشابهاً للمئذنة الشهيرة بمدينة سامراء. ويمتد السلم من أعلى سطح المسجد إلى المئذنة. ويعتبر هذا التصميم فريدا من نوعه بين مساجد القاهرة القديمة. يعتبر هذا المسجد أقدم المساجد فى القاهرة التى ظل على شكله الأصلى، وأكبر المساجد فى المدينة من حيث مساحة الأرض. That’s an incredible feeling I had while moving underneath an 1100 years old building capturing the Architectural Beauty in Ibn Tulun. 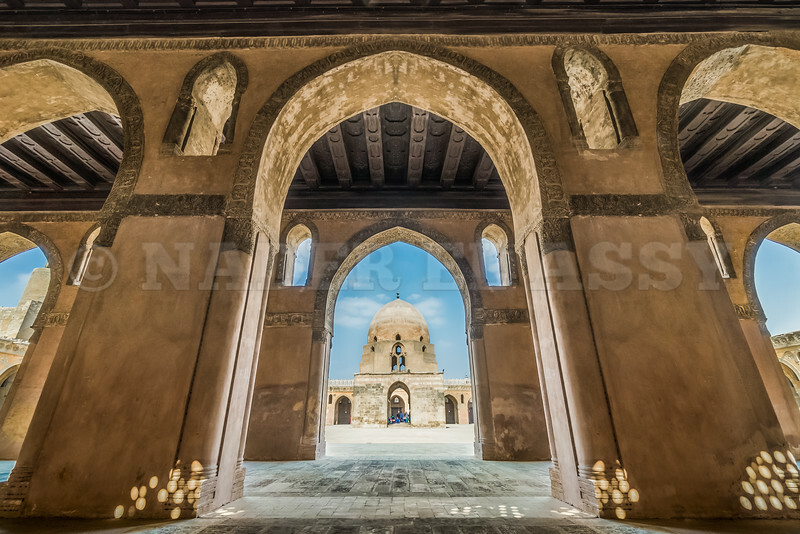 That’s Ahmed Ibn Tulun mosque in the middle of Cairo, Egypt. It is the oldest mosque in Cairo surviving in its original form, and also is the largest mosque here in terms of land area. لقد كان شعوراً لا يصدق عندما كنت أتحرك بين أروقة مبنىً عمره 1100 عاماً. إنه مسجد أحمد بن طولون في وسط القاهرة، بمصر. هو أقدم مسجد في القاهرة لا يزال محتفظاً بشكله الأصلي، وهو أيضاً أكبر مسجد هنا من حيث مساحة الأرض. Copyright © 2019 The Art of Photography. All Rights Reserved.